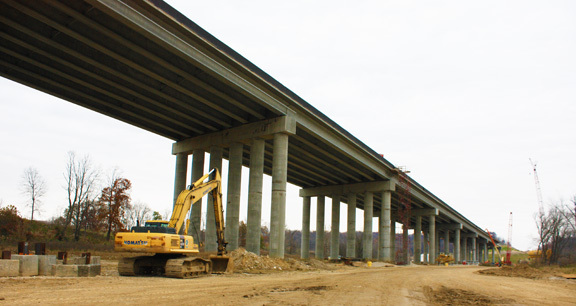 Project obstacles and solutions: The Black Ankle bridge spans over 2,000 feet of seasonal wetland areas on Section 4 of the construction on I-69. The span includes 10 sets of piers and caps supporting the massive bridge. Because of the poor soil, the piers are supported by caisson foundations and stem walls. Each caisson supports six piers. These are topped off with a cast-in-place concrete cap which supports the concrete beams and deck. The challenge on a bridge of this size is to make sure the concrete supports the massive weight across the entire span. Any concrete poured a measured space of five feet or more is considered mass concrete by INDOT engineering specifications. In this project, that included all of the footings, caissons, stem walls, piers, caps and beams. Special consideration is needed when pouring mass concrete. If the inner temperature a the core of the concrete exceeds tolerance ratios based on the ambient temperature, the concrete will produce thermal cracks. It is critical that the delivery temperature of the concrete not exceed 70 degrees F. The pier foundations measured 38' x 38' x 9' deep. Weber installed temperature probes at the core of the concrete to monitor the concrete as it cured. IMI QC/QA used a chilled water mix to keep the temperature of the concrete between 60 and 63 degrees F upon delivery. They checked each load as it entered the construction site. As ambient temperatures rose, they used ice and adjusted the water accordingly. They also introduced fly ash into the mix to keep heat hydration to a minimum without compromising strength. Fly ash as a pozzolan cementitious material does not create as much heat when it hydrates as Portland cement. IMI provided over 20,000 yards of concrete for the mass pours of the understructure of the Black Ankel bridge. That included 60 piers and 10 pier foundations. IMI also supplied 2,000 yards for the bridge deck. In 2016, this project was awarded an Outstanding Concrete Achievement Award from the Indiana Ready Mix Concrete Association for infrastructure - bridge construction.